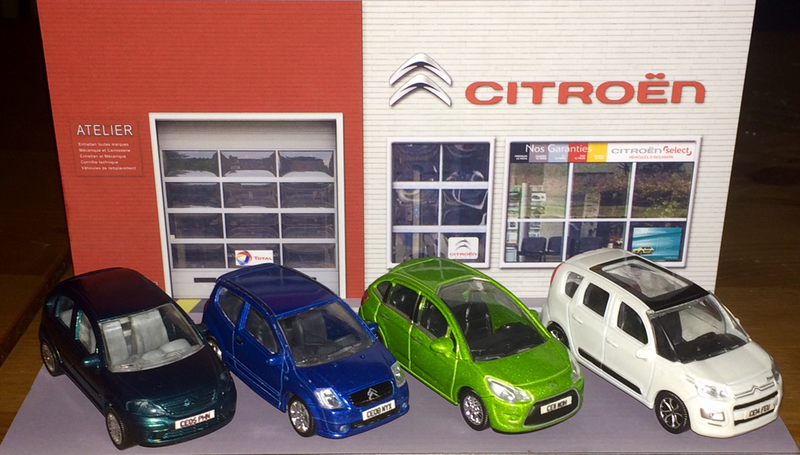 Welcome To My Citroën Diecast Model Web Site, Here You Can view my entire collection. I have been collecting since 21st January 2003, I tend to go for Models made after 1996. I have various brand of models from Norev to Starter, I tend to go for the 1/43 scale Models. I have been into Citroen since I was 11 when My Brother Had A Brand New Saxo 1.6i SX Auto in 1997, Other Family members and friends have owned Citroens and even my oldest sister passed her Driving Test in a Saxo 1.4i VSX. I have previously owned 4 Citroën's myself, My 1st one was a 2005 C3 1.6i 16v Exclusive SensoDrive in Rainforest Green and then I had a 2008 C2 1.6i 16v VTR SensoDrive in Poseidon Blue and then in 2011 a C3 1.6i 16v VTi Exclusive Automatic in Citrus Green (Pics Can Be Seen Below) a 2014 C3 Picasso 1.6i 16v VTi Exclusive EGS6 in Pearl White and now my 5th Citroën a 2019 C4 Cactus 1.2 110 Puretech Flair EAT6 in Emerald Blue. None of My Models are forsale but if your interesting in one give me an email at lbengough86@talktalk.net and I will ask my contact has he any in stock.